Big Finish: Doctor Who - THE BOUNTY OF CERES Review | Warped Factor - Words in the Key of Geek. Tony’s feeling less than bountiful. 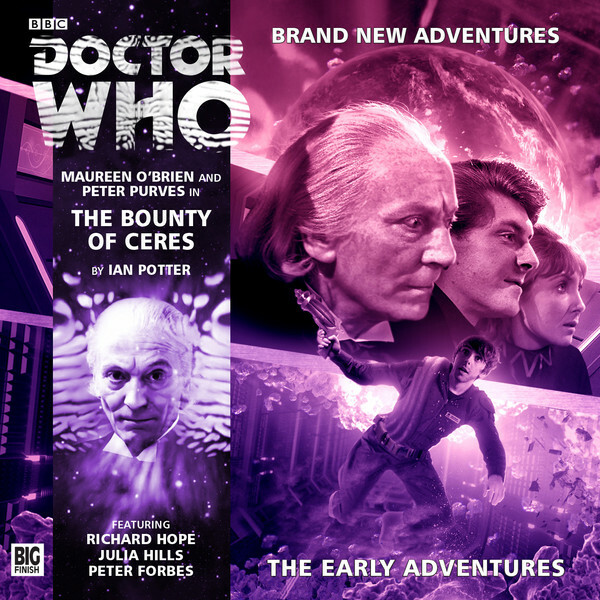 The Bounty of Ceres is the third story in the Early Adventures range from Big Finish, the idea being to expand the scope of the Companion Chronicles series into longer, more complex stories with more voices than the mostly single-hour Companion Chronicles ever allowed. The range blew the doors off listeners’ brains with its debut title, Domain of the Voord, and delivered a solidly complex and skulky second instalment, representing the Hartnell era’s predilection for the pure historical story format in The Doctor’s Tale. The Bounty of Ceres is Hartnell-era base under siege – a daunting prospect for any writer, because if there’s one area of Who that the Hartnell era did worse than the rest, it was base under siege. Step forward then, Fearless Ian Potter. The Bounty of Ceres has a lot of standard sixties space story tropes – a base on a planetoid where the outside environment is positively hateful, and only the systems that keep the base running stand between the people and scary, screamy death throes. The Tardis crew being pretty much forced out into the base due to Something Going Wrong with the Tardis, and taking pretty much the length of an episode to do so. The base being all sort so ‘gritty’ in terms of the real challenges of living and working in space – Velcro boots and sticky floors etc. And a small, isolated crew, where one is paranoid, one’s the leader and the other one’s the stolid lieutenant, worried about the safety of the mission as the paranoiac gets more and more unstable. There are cryogenic systems with whispering voices trapped in them, robots that go haywire and try to kill our Tardis crew, and a mystery on the ball of rock and ice and hatefulness that is Ceres that needs solving before everyone ends up dead in the dark. What’s more, Potter goes out of his way to get some solidly period characterisation in – the Doctor puzzling out the main elements of the issue on Ceres, Steven being brave and hands-on in his earnest space piloty way, and Vicki, bright, brave, entirely clueless of social strata Vicki, chatting away to the mission’s captain as though they were BFFs, and so helping smooth the time travellers’ way into acceptance in the base where they absolutely shouldn’t be. As the plot evolves, there are red herrings to examine, false trails and failed executions, with Captain Qureshi and her two underlings, Thorn and Moreland, dealing in a very methodical, one-problem-at-a-time way with the issues that hit the base – including the sudden presence of three more people, meaning twice as many people eating and breathing on Cobalt Corporation property. Potter has a good handle on the period, certainly – if anything, it’s a little too good, because the sense of the base being composed of egg-carton walls and cloth backdrops comes through the audio. And there’s certainly a twist to the ending, even if the twist itself leaves the story ultimately less satisfying than it would otherwise have been. What we mean is, most of the way along, you think The Bounty of Ceres is a familiar kind of Hartnell story. Then it turns out to be an entirely different kind of story, which is interesting for its own sake, but leaves you a little deflated that you’ve been tricked – along with most of the Cobalt Corporation crew and the Tardis travellers – into thinking it was something more interesting and dangerous than it turns out to be. Peter Purves and Maureen O’Brien, old hands by now at carrying the weight of a story with their dual-narration, sound like they’ve just popped forward from the sixties to do the job – you’d barely know they’d aged a day, and Purves’ Hartnell impression is spirited and more than convincing. Each of the three guest stars, Julia Hills as Qureshi, Peter Forbes as Thorn and Richard Hope as Moreland do good supporting work here, pulling the listener through the story of malfunctioning ‘maintenants’ and double-crossing crewmembers, as we try to find out whether the outside of Ceres is really getting in – and if it is, what it means to the mining operation there. But of the first series of Early Adventures, this still ends up feeling like the runt of the litter, partly because of the drag factor of Hartnell era base under siege stories (unlike the Second Doctor, the First seldom had the patience for such scenarios, and would be up and about, poking things with sticks until they made more sense), partly because one of the authentic things that comes through in the audio is the low budget of the sixties – while not in any real way applying to Big Finish audios, the cheapness of the sixties budgets almost oozes its way through the audio here – the spending of most of the first episode standing about in the Tardis, talking, would originally have been a budget-saving tactic, so there’s little need to have it emulated here, for instance, but it is. What’s probably more, the twist at the end, while clever in itself leaves The Bounty of Ceres feeling like a little less than the sum of its parts, more The Rescue than The Tenth Planet. Don’t get us wrong – it’s still more than worth the money you’ll pay for it, and the couple of ours of lifetime it’ll take to get through. But in a season along with Domain of the Voord, The Doctor’s Tale and An Ordinary Life, The Bounty of Ceres proves that the curse of the Hartnell base under siege story is still going strong, fifty years since the man himself last starred in one.